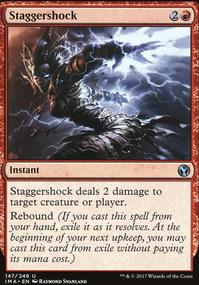 Staggershock deals 2 damage to target creature or player. Well, if you don't mind something risky Quest for Pure Flame is a cheap 1-drop that'll let your friend double burn damage for a turn. (and he can stack it.) Cards like Staggershock (also cheap) will let your friend keep resouce parity while putting counters on Quest. 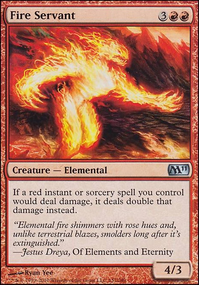 And Young Pyromancer, I'm sorry to say is absolute gold in burn decks, but also not as budget as the others. Also, I'd add about eight more mountains and four Magmatic Insights to smooth out draws. What is your win-co? One Ray of Command and a bunch Staggershock? 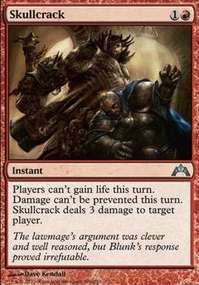 Because I've just playtested your deck and the late game is about drawing cards and removal, but no pay-off. And a single Bojuka Bog main? I don't want to sound harsh but your deck desperately needs help IMO. Put some Striped Riverwinder or something. 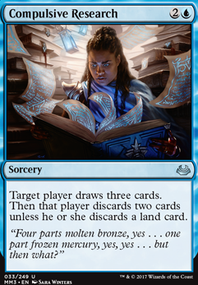 And land-lifegain is fun but 4 Radiant Fountain AND Ash Barrens is quite an unhealthy land-base. TheBloopKing on Wait, I can Attack? Never missed the deck premise. Just think that there should be some traditional strategies. If you want to run Firesong and Sunspeaker and top it off with a Resevoir. You need more cheap spells to make it reliable. I would be running atleast 10 cheap burn and 5 big burn spells. 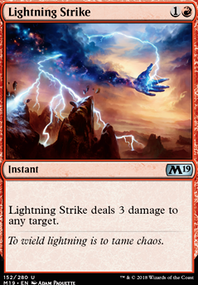 Magma Jet, Fiery Impulse, Thunderous Wrath, Staggershock, Lightning Bolt, Lightning Helix, Chain Lightning with bigger spells like Earthquake and Starstorm. 4 Thing in the Ice Flip - really good cheap wall that is a ticking clock. 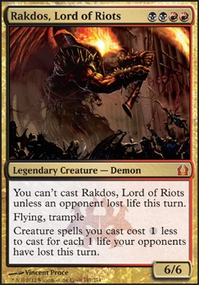 3 Baral, Chief of Compliance - makes everything non-creature in the deck cost less. With counterspells, we can make use of his second ability too. 4 Enigma Drake - cheap and effective wall that grows. 2 Cryptic Serpent - big beater that can be very cheap. 1 Kefnet the Mindful - we can easily maintain a high card count and his ability is nice. 22 lands - I will let you figure out which ones you want to use. 34 instants and sorceries - we want cheaper ones to fill the yard more quickly. 3 Sweltering Suns - the creatures not named baral survive it and it can be used for cycling too! 4 Mana Leak - we want counters! 3 Staggershock - double triggers all the way. 4 Censor - same as suns, but for countering. 3 Thought Scour - card draw that fills the yard. 1 Condescend - useful one-of. 1 Think Twice - useful one of. 1 Flame Slash - useful one-of. This should be about budget. Tell me what you think. Staggershock Is not good, same with Deathmark. That landbase looks like mesh, if you have money it can easily be made much better.